Stimulating Participation – Or a new Monthly Challenge for aspiring togs……. The main reason for posting this is to try and get some discussion going in one of the Flickr Groups I belong to. It’s the usual thing, 1000 member, all shy except for when posting photos. You come back at the end of the month and Vote on the entries – Without Votes there’s no winner !! Inspiration, or something to avoid? You decide. Went for a walk today with the dogs. Rather than retread the familiar path of the sea wall here on Canvey, we decided to travel a little further afield and ended up at Hainault Forest. The kids have never been there before, and it must be 25 yearts at least since I was there, but the memories of many a summer Saturday came flooding back. I even recognised some of the paths I used to hare up and down on my bike in the days when you could go out early on Saturday, and just come home at tea time. No mobile phones, no way of keeping in touch with home. Just a tobacco tin full of stolen dog-ends, a matchbox stuffed with tissue to stop it rattling and my bike. Despite feeling old, and realising with some sadness that the forest isn’t as big as I remember it, next time I go back, I’m going to try and find the tree I carved my name into. Only had one decent photo as we were having so much fun. 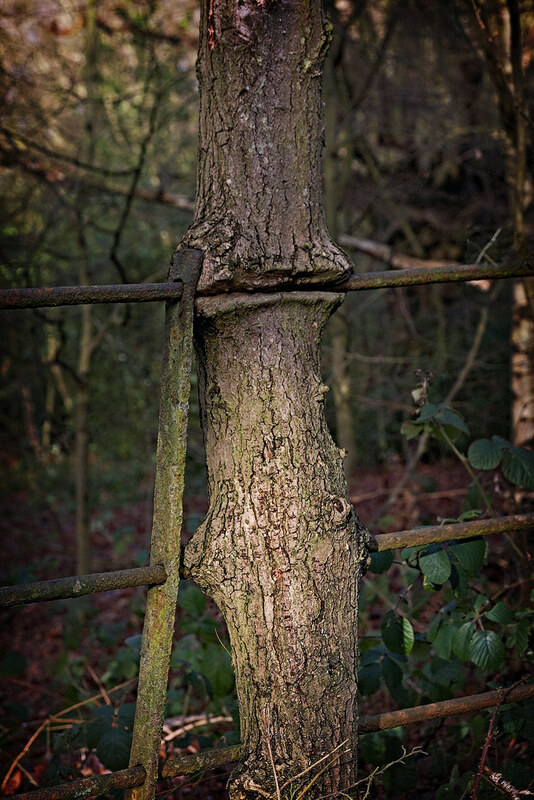 This tree intrigued me, as I couldn’t figure out if the fence had sawed it’s way into the tree as the wind blew it about, or whether the tree had grown around the fence. Well it looks like Winter has now settled back to it’s usual dull grey drizzle for the time being, making special shots that much harder to come across. I’ve not got anything for the January entry in the 2010 hotographer of the Year Competition yet, but have a few ideas in mind (it’s just finding the time to stage them. Hopefully the miserable weather will serve to inspire more creative indoor shots instead, especially as I have found a custom function for focussing without using the shutter button. It’ll be interesting to see whether I can get to grips with it. In the meantime, I’ll share the last of the snow pictures with you – I call it cupped, should have a poem to go with it at some point, just need to get my thinking cap on.